Singstar has almost reached the heights of modern pop culture which allows everyday people to become pop stars from the comfort of their lounge rooms and while you're on a winner, you might as well keep releasing the titles and Singstar Pop Hits is no exception. For those that are uninitiated into the world of Singstar, this current incarnation is almost a identical duplicate of previous incarnations, however this current version features a plethora of new songs such as Jennifer Lopez's "Jenny From the Block" to U2's "Beautiful Day". Needless to say, there is definitely something for everyone. 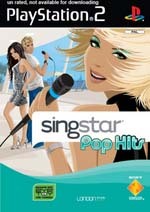 Although the interface is slightly different and updated since the last incarnation of Singstar, the gameplay is still thoroughly entertaining, especially playing with other players with the perfect Sony microphones. With that said, the game can either be purchased separately or with a pack that includes two microphones. 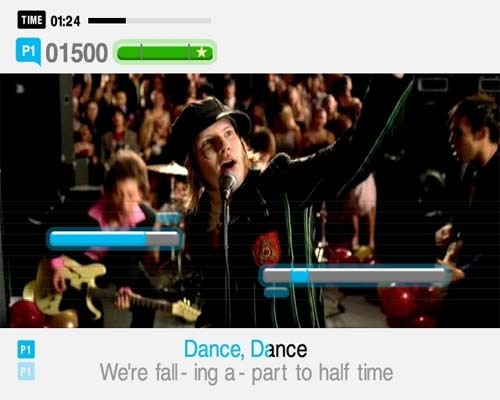 The basic premise behind Singstar which makes it more a game than a karoke experience is that the program rates the gamer on their singing ability which is based on the key and notes they sing which is hopefully as close as the original song in order to gain more points. You can also play a duet mode or against other players which makes for a great party experience. In conclusion, recommended to those that loved the previous incarnations or for those interested in seeing what all the fuss is about. Play it solo, with friends or at a party with 8 people, Singstar Pop Hits is a classic! All Saints -- "Black Coffee"
Jennifer Lopez -- "Jenny From the Block"
Avril Lavigne -- "My Happy Ending"
Jojo -- "Leave (Get Out)"
Britney Spears -- "Baby One More Time"
Lily Allen -- "Littlest Things"
Cascade -- "Every Time We Touch"
My Chemical Romance -- "Helena"
Corrine Bailey Rae -- "Put Your Records On"
Daniel Powter -- "Bad Day"
Norah Jones -- "Don't Know Why"
Dannii Minogue -- "I Begin to Wonder"
Evanescence -- "Bring Me to Life"
Fall Out Boy -- "Dance Dance"
Girls Aloud -- "No Good Advice"
Scissor Sisters -- "I Don't Feel Like Dancing"
Goldfrapp -- "Ooh La La"
Sugababes -- "Push the Button"
Gorillaz -- "Feel Good Inc."
Jamelia -- "Beware of the Dog"
Will Young -- "Switch It On"
James Morrison -- "You Give Me Something"